For solving Parallel Circuits, a number of branches are connected in parallel. Each branch contains a number of components like resistance, inductance and capacitance forming a series circuit. Each branch of the circuit is analysed separately as a series circuit and after that, the effects of each branch are combined together. For circuit calculations, the magnitude and phase angle of current and voltage is taken into consideration. The method which yields quick result is applied. In this article, the Phasor Method is explained in detail. Consider the circuit diagram below to solve the circuit step by step. Step 1 – Draw the circuit diagram as per the given problem. As we are considering the above circuit as an example. Here, two branches connected in parallel are taken into consideration. One branch contains resistance and inductance in series. 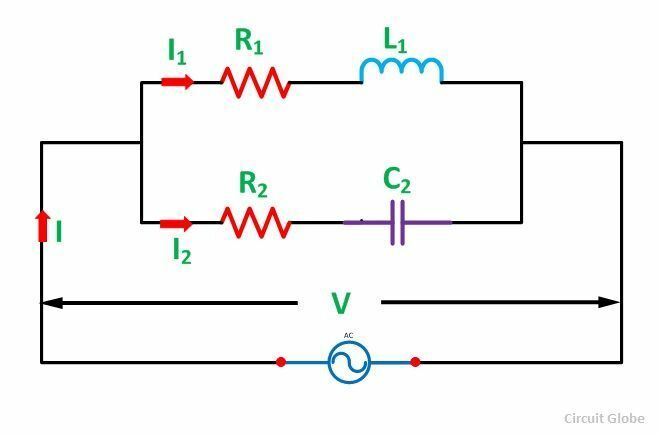 The second branch consists of resistance and capacitance in series. The supply voltage is V volts. Step 2 – Find the impedance of each branch of the circuit separately, i.e. Step 3 – Determine the magnitude of current and phase angle with the voltage in each branch. ϕ1 is lagging this means it is for inductive load and ϕ2 leading as it is for the capacitive load. Step 4 – Draw the phasor diagram taking voltage as the reference. 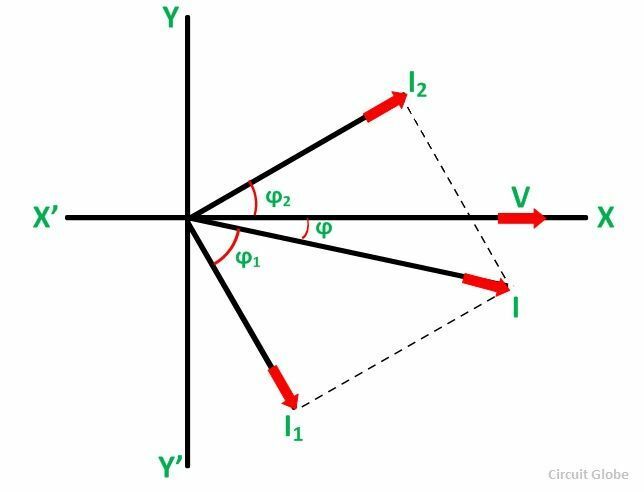 Represent the various branch current on it as shown in the phasor diagram below. Step 5 – Now, find the phasor sum of the branch currents by the methods of components. Step 6 – Find the phase angle ϕ between the total current I and the circuit voltage V.